Hot Springs, Arkansas is known as America’s First Resort for a reason. It’s a small city with a really big heart. This small city is packed with plenty of attractions and adventures that you just can’t pack them all in a single visit. If you’re planning a visit to Hot Springs this weekend, here’s a list of five of the Hot Springs attractions that you just have to see. The Hot Springs National Park is the oldest park in the city, nestled at the heart of the Ouachita Mountains. It is valued for its picturesque beauty and elegance. The national park is a hub for those that love the outdoors as it provides access to multiple hiking and biking trails, campsites, and fishing grounds. It also provides plenty of outdoor amenities that can certainly make your outdoor stay as comfortable as possible. The National Park is the home of Hot Springs Mountain, the city’s primary source of its namesake hot springs that are said to have healing powers. Located at the heart of the Ouachita Mountains, this 1.8 million-acre forest spans Arkansas and Oklahoma. It contains managed wood and timber harvesting grounds, wilderness management, minerals leasing, and plenty of avenues for outdoor recreation. See the sites and all the beautiful scenery as you traverse paved scenic roads or ride a kayak or canoe through the rivers and lakes. The Ouachita National Forest is definitely a nature lover’s choice as it is a popular venue for hiking, horseback riding, driving off-road vehicles through its many trails, which range from the easiest to the quite challenging, and is home to plenty of wildlife that can be spotted through your binoculars when you go bird watching or wildlife spotting. The Grand Promenade is one of the city’s best attractions as it provides a wonderful view of the city within the city, and the mountains that surround it. This half-mile long pedestrian-only elevated path provides an up-close and personal unobstructed view of Hot Springs’ Bathhouse Row and Central Avenue, which also serves as an oasis from the noise of the city. You can be sure to find some of the cold and hot springs the city is famous for while strolling along this brick-laden path. This was actually deemed a National Recreation Trail in 1982, which is also a frequent starting point for several hiking trails that go through the national park. 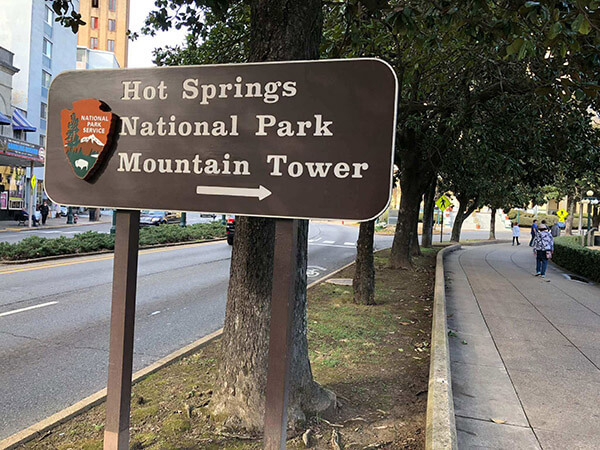 The not-so-secret secret of the city of Hot Springs, Arkansas is its connection to gangsters frequenting the city sometime in the 1920s to the 40s. Hot Springs was a frequent haven for gangsters looking for a place to hide out or get away due to its “convenient” location in the midst of the mountains and the many hot springs located in the area. As a result, it became a hotbed for bootlegging, gambling, and other illicit activities. Providing a historically accurate and entertaining account of the events and interactions of some of America’s most notorious criminals in the area is the Gangster Museum of America found in downtown Hot Springs. Several galleries have been opened in the museum, each providing stunning audio visual presentations that give insights into the lives of the gangsters that called this charming little town their haven of choice. If you are looking for a place that contains beautiful gardens and is lush with greenery and botanical life, then make sure to drop by the Garvan Woodland Gardens, a botanical garden complex located inside the Hot Springs National Park and belonging to the University of Arkansas. The garden is composed of over fifteen separate natural areas and picturesque sites of interest that will surely make you feel one with nature. The garden’s 210 acres of beautiful wild and manicured territories are surrounded by the Ouachita Mountains and the majestic Lake Hamilton, offering a picturesque view of the garden’s many elements all around. While in the garden, be sure not to miss the highlight of the garden, which is its award-winning Garden of the Pine Wind Japanese garden.